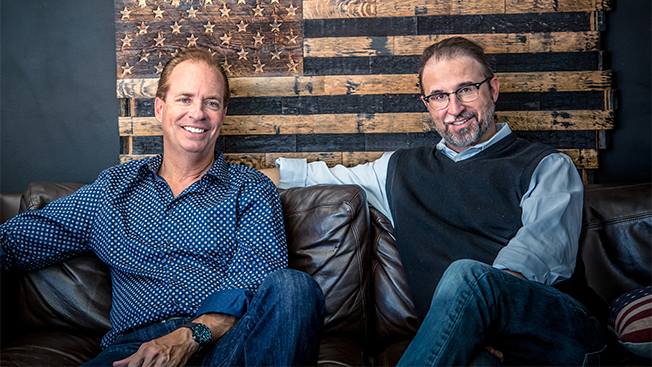 Despite talk of the end of the advertising agency business model, former CP+B executives Jeff Steinhour and Markham Cronin think small to mid-sized creative shops can thrive as long as they focus on producing great creative above all else. The duo, who have more than 50 years of advertising experience between them, felt so strongly about the viability of this narrative that they launched their own full-service agency in Miami in the form of Markham & Stein. "This thing has been a long time coming," said Cronin, who officially opens the new shop with his partner today. After leaving CP+B and leading creative at other agencies, he opened his own operation Markham Unlimited in 2005. But Cronin tells Adweek, "I was spending 20 percent of my time doing the valuable part of my job for clients and the other 80 percent actually running the agency. So when the opportunity came to talk to Jeff about maybe doing this, there was no question it was something we should try and do together." Markham and Steinhour spent 10 years together at CP+B on the creative and accounts sides of the business, respectively. "Clients are looking for groundbreaking branding solutions that once upon a time required a large agency," says Steinhour, who was one of that shop's four founding partners along with Chuck Porter, Sam Crispin and Alex Bogusky. Steinhour played a central role in the agency's development both before and after its acquisition by MDC Partners. He describes this latest project as "A new kind of shop … that brings the strategic and creative power of a big agency in a more nimble and tenacious package." Prior to today's launch, the two had been working together for several months for a range of clients including Markham Unlimited's H & H Jewels, Coconut Grove Business Development District, Oriental Bank and more, in addition to winning global agency of record duties for international boat engine maker Mercury Marine, which is the new agency's first official client. M&S has also inherited all of Markham's employees to create a 21-person staff. Cronin explained the thinking behind the new operation to Adweek: "As we've grown, we talk to bigger and bigger clients which are talking to smaller and smaller agencies. The old model of dumping every piece of marketing activity into a big agency is at its end: We're seeing more project-based work and work split into separate disciplines. This benefits a shop of our size as the nimbleness and lack of overhead gets us talking to national and global clients." The idea moving forward is that Markham & Stein can serve as "the big brain" or "the idea factory" for clients large and small while partnering with household name agencies and smaller operations alike to bring those ideas to market. Why Miami? Cronin said, "It's one of the most vibrant, thriving cities in the U.S. with heavy South American and Latin American influences. Both of us have lived in Miami for the past 25 years, and selfishly I believe that [the city] deserves a handful of good agencies." On that front, Markham & Stein already has two clients based in Puerto Rico and a small number of employees who work there. Regarding the new shop's origins, Steinhour says, "After I decided to leave CP+B last fall, Mark called me and said, 'I could use your help with a couple of pitches.' That went well, one thing led to another … and we said, maybe it's time to do something more formal. We formed a new LLC and called all of his clients, none of who had any issues. It felt pretty natural." Cronin said the new shop wants to build a distinctive creative culture. "Amid the splintering of the industry, something has been lost. Agency names and websites are different, but their output feels very similar." Markham & Stein's principals don't want to reinvent the wheel—they simply want to bring a bit of that unspecified "something" back to advertising. "Every week, you read about some new digital/social media platform like 'the Uber for agencies' or whatever … but if you don't have a good idea, you're kind of wasting your time." The shop's first TV, print and digital campaign for Mercury Marine should launch in fall 2016.